(Bozeman, Mont) On Sunday 3/4/2012 at about 12:30 pm Sheriff’s Search and Rescue received a call of an injured snowmobiler in the Taylor Fork area approximately 15 miles off of US 191, south of the Wapti “Y”. 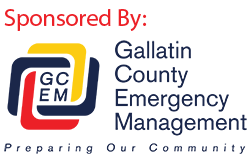 The call was received at the West Yellowstone Police Department and forwarded to Gallatin County 911. Coordinates retrieved from the reporting person’s cellular phone helped confirm the location. The Big Sky Section of Search and Rescue, a Deputy Sheriff/Coordinator, a National Park Service Ranger, and two Forest Service Law Enforcement Officers responded to conduct the search. A 24 year old Bozeman man was riding his snowmobile with a friend in a popular unmaintained forest service area away from groomed trails. The man was riding in an area with several windblown cornices and mistakenly drove off a ledge that was much steeper than it appeared. The man was in severe pain and suffered two lower ankle injuries and was complaining of pain and numbness in his lower back and lower extremities. SAR teams located the male and determined that removing the man by snowmobile and toboggan would cause too much pain, take too much time, and potentially injure him further.